The new CGI Yoda in 'The Phantom Menace' isn't the only thing George Lucas has tinkered with for the upcoming release. As previously reported, 20th Century Fox official announced that all of George Lucas' 'Star Wars' movies are coming to Blu-ray on September 16. 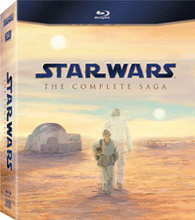 There will be three different releases, with the major one being a mega 9-disc set 'Star Wars: The Complete Saga' (including all six films) for a suggested list price of $139.99, as well as 'Star Wars: Prequel Trilogy' and 'Star Wars: Original Trilogy' -- 3-disc sets with a suggested list price of $69.99. The folks over at TheHDRoom have reported that LucasFilm and ILM have made a few surprise "tweaks" to the 'Star Wars' films for their Blu-ray release, the main one being an all-CGI Yoda replacing the ugly (and downright creepy-looking) Muppet used in the first prequel. Now according to The New York Times, Matthew Wood has confirmed a few more changes including Obi-Wan's updated krayt dragon howl in 'A New Hope,' Darth Vader's new "Nooooooo!" at the end of RoTJ, and even blinking ewoks. Wood also noted to IGN, "Every time we watch the movies he's (Lucas) got something he wants to change... And so there's obviously changes done to the films, visually as well as audio-wise. So there are some changes in the Blu-ray version that you'll have to find." You can find the latest specs for 'Star Wars: The Complete Saga,' 'Star Wars: Prequel Trilogy,' and 'Star Wars: Original Trilogy' linked from our Blu-ray Release Schedule, where they are indexed under September 16.